The Intra Gastric Balloon is a non-surgical aid in the treatment of obesity. The Intra Gastric Balloon is a soft, expandable, silicone balloon that is placed inside the stomach via endoscopy that enters through the mouth and into the stomach with or without sedation. 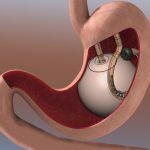 How Does the Intra Gastric Balloon Work? A soft balloon fills a large portion of the stomach, and therefore reduces the capacity of the stomach. This creates a feeling of fullness for the patient and does not allow for overeating, therefore allowing the patient to effectively diet without feeling continuously hungry. The first week you will be on a liquid and puree diet. After the first week, you can begin a solid diet with recommendations from the nutritionist. During the six month period the balloon is in place, the Nutritionist will monitor your progress. You will receive education and training on nutrition and lifestyle changes for long-term success. After the BIB is removed, you will continue to meet our team for additional support and guidance if needed. When eating less the body draws the required energy from its own fat.